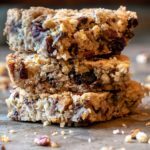 These gluten free orange cranberry chocolate bars with toasted pecans and coconut are perfect for the holidays or any time of year. In a large bowl, combine coconut oil, maple syrup, and vanilla. Mix in coconut, pecans, cranberries, orange zest and chocolate chips. Press dough firmly into baking dish, wetting hands with water to help pat dough down evenly. Bake at 350 degrees for 20 minutes or until lightly brown on top. Makes 12-16 Bars depending on how big you cut them.